Out There - Carla Zaccagnini: no. it is opposition. 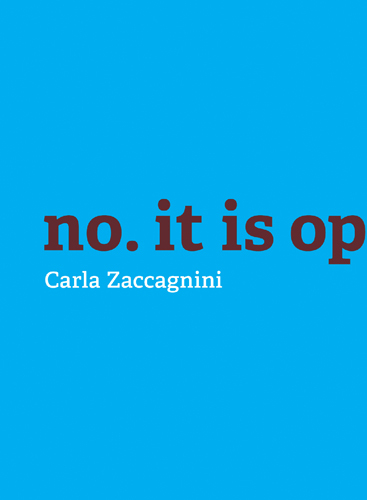 The palindromic title of Brazilian artist Carla Zaccagnini’s no, it is opposition. hints at its conceptual structure, which the artist describes as “forking paths and crossroads.” The book documents an exhibition which the viewer enters twice, encountering the same work again, but differently. The exhibition catalogue reflects the palindromic nature of the exhibition, mirroring itself and the exhibition in both structure and form. Essays by Emelie Chhangur and Carla Zaccagnini in English and Portugeuse (with a little bit of Spanish for good measure). Designed by Lisa Kiss.